Wilfrid Prest’s biography, William Blackstone: Law and Letters in the Eighteenth Century, was published back in 2008, but it has just been released in paperback. The book is an absolutely wonderful treatment of this deeply important figure in English and American law, and I note it here because it discusses some of Blackstone’s religious commitments and views. The publisher’s description follows. Lawyer, judge, politician, poet, teacher, and architect, William Blackstone was a major figure in eighteenth century public life. Over his varied and brilliant career he made profound contributions to English politics, law, education, and culture through involvements in legal practice, Parliament, and the University of Oxford. Throughout he also remained engaged in his society’s literary and spiritual life. 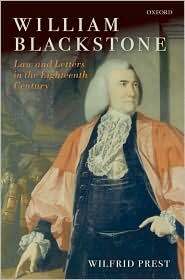 Despite the breadth and influence of his work, Blackstone the man remains little known and poorly understood, the lack of engagement with his public and private life standing in stark contrast to the scale of his influence, particularly on the development and teaching of the law. Blackstone’s ‘Commentaries on the Laws of England’ remains the most celebrated and influential text in the Anglo-American common-law tradition. This great book has inevitably overshadowed its author, while the dispersal of his personal and professional papers further complicates the task of understanding the man behind the work. The lack of a thorough account of Blackstone’s life has fuelled controversy surrounding his intellectual background and political views. Was he the deeply reactionary conservative painted by Bentham, or rather a committed reformer and early champion of human rights? The present biography makes full use of a considerable body of new evidence that has emerged in recent years to shed light on the life, work, and times of this neglected figure in English and American history. Exploring Blackstone’s family upbringing and private life, his political activities and ideology, his religious outlook, and championing of the enlightenment, this book weaves together the threads of an extraordinary mind and career. « French PM to Jews and Muslims: Modernize!